Airbus has a 1,100-flight-hour test campaign planned for the A330-900, aimed at achieving EASA and FAA type certification in mid-2018. Sixteen weeks into flight testing, the Rolls-Royce Trent 7000-powered A330neo (“New Engine Option”) has been performing as expected, according to Airbus (Stand J23, Chalet CD17). Initial tests have been completed with “aircraft behavior currently in line with predictions,” the manufacturer told AIN. Two prototypes of the twin-aisle, two-engine jet are flying, while the assembled first-production unit is undergoing cabin installation, painting, and engine attachment ahead of first flight in the second quarter of the year; and a third flight-test machine now in final assembly is scheduled to fly in mid-2018. Also, after being used “to define main tuning for [the] A330neo initial development phase,” the manufacturer’s A330-200 flying testbed has handed that work over to the A330neo prototypes. By February 1, the first A330-941—manufacturer's serial number (MSN) 1795/registration F-WTTN—had flown 58 times and accrued 198 flight-hours since its October 19 maiden flight. The second example, MSN 1813/F-WTTE, had logged 119 flight hours during 29 flights since being handed over to the Airbus Flight & Integration Test (F&IT) Centre in Toulouse, France, on November 16. After MSN 1813’s flight, the first A330neo (which had notched almost 80 flight hours in November) spent a week on the ground, perhaps undergoing initial maintenance. An early flight by MSN 1813 is understood to have been the A330neo’s longest to date, clocking 7 hours, 17 minutes. Overall, flight-test activity has included flight-envelope expansion; high- and low-speed calibration of anemometry (altitude and airspeed indication); and checks of engines, aircraft-handling quality, flutter, and loads calibration. In addition, the first stalls were performed and climb and brake-on-landing performance tested. Under what Airbus terms a “fast-paced development program from launch to first delivery,” the 1,100-flight-hour test campaign aims to achieve EASA and FAA type certification for the initial A330-900 variant around mid-2018. Airworthiness approval for the smaller A330-800 variant (for which Hawaiian Airlines is the only customer), is expected to require another 300 flight hours. 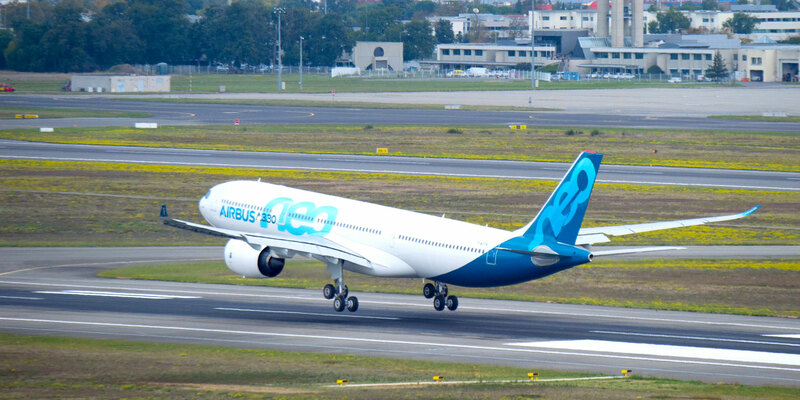 The overall A330neo flight-test program, involving MSN 1795 (600 flight hours) and MSN 1813 (500 flight hours), comprises five phases, the second machine having flown midway through the first such period. These include: initial development; development tests; certification tests; EIS preparation; and EIS support. Each flight-test A330neo is equipped with a medium flight-test instrument (FTI) fit. The first-production machine will sport a lighter FTI setup. The two prototypes have dual head-up displays and activated avionics functions, including airborne-traffic situation awareness, and ground-based landing, runway-overrun prevention, and transponder-equipped traffic and terrain collision-avoidance systems. Airbus is using the two prototypes to check performance of system options, the two aircraft being fitted with equipment provided by alternative FMS, satcom, and brake suppliers. Meanwhile, FTI equipment on third flight-test aircraft A330-841 MSN 1888, which is being used for certification of the smaller, longer-range variant, matches the first prototype's systems specification. TAP Air Portugal's first production aircraft, A330-941 MSN 1819, will have a light equipment fit for production and cabin checks. MSN 1795—The manufacturer has established strategic flight-test programs for each aircraft, led by MSN 1795, which is being used for flight manual work, autoland, engine development, and handling qualities, according to du Ché. "We also have external noise, which is the chief feature of the campaign" and forms part of the initial flight-testing phase. From the start of development testing, MSN 1795 will be fitted with ice shapes as Airbus explores aircraft handling with compromised aerodynamics. The starboard powerplant has been “very well instrumented” for the cold-weather campaign. This first A330neo prototype has Honeywell FMS and satcom and Messier-Goodrich brakes and is equipped with tail-bump protection for the Vmu minimum unstick takeoff speed demonstration. Formal airworthiness approval is planned at the end of the EIS-preparation fourth phase. MSN 1813—The second prototype A330neo MSN 1813 is fitted with the alternative Thales FMS, Iridium satcom, and Honeywell braking system, with Airspace Refresh toilets in the passenger cabin. For performance testing, its Trent 7000 engines are equipped with rakes (primary and secondary gas flow pressure taps), which permit Airbus and Rolls-Royce to compare installed thrust with that measured in ground testing. As the first aircraft completes AFM and noise approvals, power-management certification should be finalized on MSN 1813. Before that stage, it has a busy testing schedule that includes high-altitude, natural-icing, and route-proving duties, and two periods of hot-weather operations. The second aircraft also is earmarked to conduct Cat III autoland certification activity, which will continue to the end of the fifth flight-test phase (after planned EIS). It will be used for aerodynamic performance and airline operations validation. MSN 1819—During the second quarter of 2018, Airbus plans to fly first-production A330neo MSN 1819, which is not part of the certification effort, to validate the A330neo passenger cabin, including air-conditioning performance. Accordingly, it has been configured with the manufacturer’s Airspace interior, designed to accommodate up to 10 more passengers than earlier A330-200 and -300 models. In January, cabin installation remained to be completed, along with painting and engine installation. MSN 1888—The 300-flight hour A330-800 flight-test campaign with MSN 1888 will be mainly dedicated to “flight physics tests,” according to du Ché. This airframe entered the Toulouse A330 final assembly line last November and the first flight is expected in mid-2018, according to Airbus. MSN 871—Before the first A330neo’s inaugural flight almost four months ago, Airbus had already completed 130 flight hours with A330-200 MSN 871 between late 2015 and the second quarter of last year. The flying testbed’s work involved validation of the A330neo’s upgraded flight-control laws, systems de-risking, and initial checks of Airspace cabin components (such as overhead luggage bins).